The health ministry’s assistant undersecretary for drug and food control Dr Abdullah Al-Bader said a private clinic and a center were found selling drugs in violation of the law and ministerial decisions controlling the process of dealing with medicines. Inspection committees that inspected a private polyclinic and a private clinic discovered a large quantity of medicines, some of which are not approved by the health ministry and smuggled from neighboring and Southeast Asian countries. He said the case will be sent to the public prosecution.-K.T. The General Directorate of Residence Affairs in a statement to all governorates in the country said the names of five new African countries have been added to a list of countries whose domestic workers cannot be recruited in the country. This came following instructions given by Kuwait’s Ministry of Foreign Affairs. With the inclusion of the five countries the total number of countries now stands at 20.The five new countries are Djibouti, Ethiopia, Burkina Faso, Guinea and Guinea-Bissau. The 15 countries include Kenya, Uganda, Nigeria, Togo, Senegal, Malawi, Bhutan, Chad, Tanzania, the Gambia, Ghana, Zimbabwe and Madagascar.5 other African countries have been temporarily banned from sending domestic workers to Kuwait – Cameroon, the Democratic Republic of the Congo, Burundi, Eritrea and Liberia. The sources pointed out, that instructions were issued not to issue an entry visa for domestic workers of African countries that have no embassies in Kuwait and/or if the validity of the passport is less than 3 years.-A.T. The traffic department said appointments for driving tests will be done through the interior ministry website (www.moi.gov.kw) from Sunday, April 28, 2019. It added the working hours at the test departments are from 8 am until 5 pm. –K.T. Commerce and Industry Minister Khaled Al-Roudhan issued six decisions to suspend the licenses of six insurance companies for three months or until the violation is removed, whichever is earlier. The companies are: Ain Takaful, Aman Takaful, Ghazal Takaful, Dar Al-Salem Takaful, Kuwait-Qatar Takaful and Ilaf Takaful. The decisions stipulated that insurance policies issued by the said companies before the suspension remain valid, while the companies will continue payments and compensations due on them. Meanwhile, informed sources said some companies that were threatened to be suspended by the commerce and industry ministry rectified their status, while others where on sound grounds.-K.T. Aadhaar is the 12-digit number issued to the Indian citizens by Unique Identification Authority Of India (UIDAI). It contains both the demographic as well as biometric data of the citizens. It is used as a digital identity proof for availing a host of government subsidies and benefits. In some cases, such as for getting a permanent account number (PAN) card by the Income Tax Department or getting food essentials under the public distribution system (PDS), having an Aadhaar is mandatory. However, due to a number of reports over the past couple of years regarding the security of Aadhaar database, it is quite natural for citizens to be worried about the use of their data. We explain how you can check where all your Aadhaar has been used. STEP 1: Open https://uidai.gov.in/ and under the ‘My Aadhaar’ drop-down, look below the ‘Aadhaar Services’ section and select ‘Aadhaar Authentication History’ option. STEP 2: On the redirected page, enter the 12-digit Aadhaar number along with the number shown in the CAPTCHA image. Then, click on the ‘Send OTP’ tab which will open the next page. You will also get a one-time password (OTP) on the registered mobile number through SMS. STEP 3: On the next page, the first option ‘Authentication Type’ is set as ‘ALL’ by default. The drop-down lets you filter to the specific type of authentication request such as demographic, biometric, OTP, etc. In the second option ‘Select Date Range’ you will need to manually select the dates from the drop-down. It must be noted that only the authentication done during the past six months are available in the database. Below that, in the third option ‘Number of Records’, you can check up to last 50 Aadhaar authentication records. And finally, in the OTP option, you will need to enter the OTP received on the SMS and click on ‘Submit’ tab which will open the next page. STEP 4: On the next page. you will be able to view the entire list of Aadhaar authentication requests. It shows all the places where your Aadhaar number has been used both successfully and unsuccessfully. The list can also be downloaded as a password protected PDF file. To open it, you need to enter the first four letters of the individual’s name in upper case followed by their birth year. Informed sources said the government told the National Assembly it has agreed to hold a government-parliamentary meeting to decide on a legislative plan to deal with the population structure and issue several executive measures on iqama trafficking and Kuwaitization. The sources added that the two authorities are in agreement on a proposal that an expat must provide a document proving that they are leaving the country to receive their indemnity if they are terminated or resign from their jobs in the public or private sector.-K.T. The nursing society strongly condemned the beating of a nurse at the maternity hospital by a Jordanian man, adding that it will take all legal action against the attacker. The society said attacks against nurses must be met by strict punishments, especially since such acts have been repeated, and demanded a legislation to protect healthcare professionals, especially nurses, from such incidents. The society said the beaten nurse – who is 18 weeks pregnant – attempted to warn the suspect that non-patients are not allowed to enter the x-ray area and that his wife is being taken care of, but he refused to comply and beat the nurse.-K.T. Following the alleged departure of 30 foreign advisers from Kuwait, the government has warned against doing away with rare expertise.The recent campaign of Kuwaitization prompted a number of ministries and government departments to expedite the termination of the services of consultants who were working on sensitive files and were fully conversant with issues contained in each file. Therefore, the government sources say, it would have been preferable if these consultants were allowed to complete the job on their hands. About 30 foreign advisers left the country after ending their contracts because of the parliamentary threats to interrogate ministers on this issue.The ‘exodus’ of experts may ‘bleed’ the country in vital areas. The concerned bodies should have waited until appropriate replacements were found.The policy of replacement of expatriates with citizens is a must, but it should be done gradually, not randomly because the effects will be negative.-A.T.
An ambulance responding to a call collided with a vehicle on Fahaheel Expressway near Jabriya. The accident led to the ambulance flipping over, and left two technicians on board injured. Five injuries were reported – two paramedics were admitted to the ICU, while three civilians suffered bruises and are in stable condition.-K.T. A new US report shows that Kuwait is the seventh richest country in the world, according to a report released by the American economic research firm. The same report showed Qatar is ranked first in the world, but on the GCC level Kuwait takes second position after Qatar. The report said the reason for this was due to the strong financial position of Kuwait and the rise of economic indicators and the possession of about 8 percent of the proven reserves of world oil.The report pointed out that the Qatari per capita GDP is about 135 thousand dollars, and according to the report the Kuwaiti is about 70 thousand dollars annually. The report said that the indicators of the Qatari economy gradually regained its balance and recorded a better improvement according to official figures of the state and international financial institutions. The report pointed out that the Gulf countries occupy advanced levels due to the financial reforms carried out by those countries in order to achieve positive growth, and pointed to the decline of the UAE and Saudi Arabia in the world ranking by 3.5 and 5 percent, respectively, where the share of the UAE national 67 thousand dollars and the Saudi 57 thousand.-A.T.
MP Ahmed Al-Fadel has submitted a proposal to ban certain video games due to their negative impact on the mental health of users, especially children. According to studies which are accessible online; video games such as Fortnite, PUBG and the Blue Whale Challenge negatively affect the mental and social behaviors of young people. These games encourage the youths to adopt aggressive and suicidal tendencies, he explained. He said the number of parents complaining about these types of video games has been increasing, particularly since these games are not subject to any regulation; hence, it is easy for children to acquire them. Since most of these games are multiplayer online shooters, children are vulnerable to radicalism by ill-intentioned individuals or groups targeting innocent minds. For this reason, the MP suggested that the minister of finance and Communication and Information Technology Regulatory Authority must ban video games that fall under the abovementioned category or those proven to have mental, social or behavioral impact on users.-A.T. The Civil Service Commission decided working hours for government departments during the month of Ramadan will be from 9:30 am to 2:00 pm. These timings apply to the ministries of commerce, awqaf, justice, public works, education, services and information, authorities of housing care, ports, agriculture, youth, sports, environment, industry and minors’ affairs, departments of customs and fire, Credit Bank, Zakat House, Municipality, Civil Service Commission and the National Council for Culture, Arts and Letters. The timings for all other departments are from 10:00 am to 2:30 pm.-K.T. Despite the urgent need for technological development to eliminate the documentary cycle and shortening the procedures, this technical transformation sometimes causes crises due to errors resulting from insufficient preparation for technical applications. Since the decision by the Ministry of Interior to cancel the residence sticker on the passport, there have been many problems that require to be looked into, most notably the traffic jam in front of the immigration departments and the Public Authority for Civil Information (PACI).Three and a half hours are lost by an expatriate to correct a mistake made by an employee who fails to complete the transactions to his/her because PACI in South Surrah has not prepared a plan to address the situation where more than one thousand expatriates visit the authority and the number of employees is not enough to complete these transactions. There are hundreds of complaints from citizens and residents about the failure of some immigration departments and the PACI because they suffer following the decision by the Interior Ministry to do away with the residence stickers on the passports.A visit to the immigration offices in Farwaniya, Hawalli and the Capital governorates showed most of the people had come to update their data and renew the residence to get identities before the travel season.The people described what is happening at the immigration departments as unacceptable, pointing out that some employees make mistakes while updating the data. Once the error is discovered, the application is re-printed and the whole process has to be repeated but it is unfortunate that the expatriate has to pay the fees for the issuance of another civil card, which means KD 10 instead of 5.There is congestion at the PACI building in South Surrah and although there are 80 counters, the number of employees does not exceed 40%, and the others enjoy sitting around doing nothing. Security officials tried to control the chaos, but all that they could do was preventing those with no numbers from entering the inner hall.-A.T.
After being ranked number 1 in the NIRF Rankings 2019, under the Management category, IIM-Bangalore has added another feather to its cap. The B-school’s post graduate programme in Enterprise Management (PGPEM) has been ranked 12th in Asia-Pacific region (APAC) and 61st globally in the QS Executive MBA rankings 2019. This is reflective of IIMB’s mission to nurture innovative global business leaders through holistic and transformative education. With the announcement of these rankings, IIM-B has become the only B-school in India to be a part of top 100 B-Schools globally and top 16 in APAC, for the second consecutive year. The QS Rankings identify the world’s top universities in individual subject areas so that students who know what subjects they are interested in can find suitable universities. QS Executive MBA Rankings 2019 have been ranking B-schools based on certain parameters such as thought leadership, executive profile, diversity and career outcomes. Public Authority for Manpower (PAM) has referred 422 labor law violations to the General Department of Investigations since Jan 1 until April 17, 2019.In this context, Deputy Director General of Manpower Protection Abdullah Al-Mattawtah stated the violations as follows; work inspection (29 ), occupational safety (178), permanent suspension (72) and labor (502). He reiterated that 143 violations were registered against 4635 workers concerning Article 10 of labor law.-A.T. The Governor of Mubarak Al-Kabir Mahmoud Bushehri has called on the concerned authorities to evict the bachelors from family residential areas stressing this phenomenon is unacceptable, especially after the increase of complaints from the people living in those areas.The governor stressed the complaints of the people deserve attention and said there is an urgent need to cooperate with citizens of the province to end the problem without delay. He stressed the readiness of the governorate to provide all aspects of support to all parties to take legal action against ‘singles’ and those who lease apartments for them.-A.T.
An official source at the manpower authority said the authority exempts expats from the ban on transferring their residencies from small projects to the private sector if a worker initially transferred to a small company locally. The source said the decision banning the residency transfer from small projects applies to workers that were brought from their countries to work in small enterprises, adding such workers cannot transfer to the private sector and are only allowed to transfer to other companies in the small projects sector. –K.T. The spokesman for the team of Friends of the Disabled Saleh Al-Zafairi has said the violations related to exploiting the car parking allocated for the disabled decreased in 2018 to 4,765 compared to 14,544 violations during 2017 after the implementation of the legal article against violators.This is an indication of the awareness of motorists and their response to the right of people with disabilities. The Friends of the Disabled team has called on the motorists to avoid the legal penalty by cooperating and reporting any violation of the rights of persons with disabilities.-A.T.
Indian Frontliners proudly announces – IFL Part-22 book on women Talents -“Indian Shining Stars” release Function with National Integration Cultural Showwill be held on 26th APRIL 2019, at 5:45 PM Friday at Kuwait Medical Association Hall, Jabriya - Kuwait. 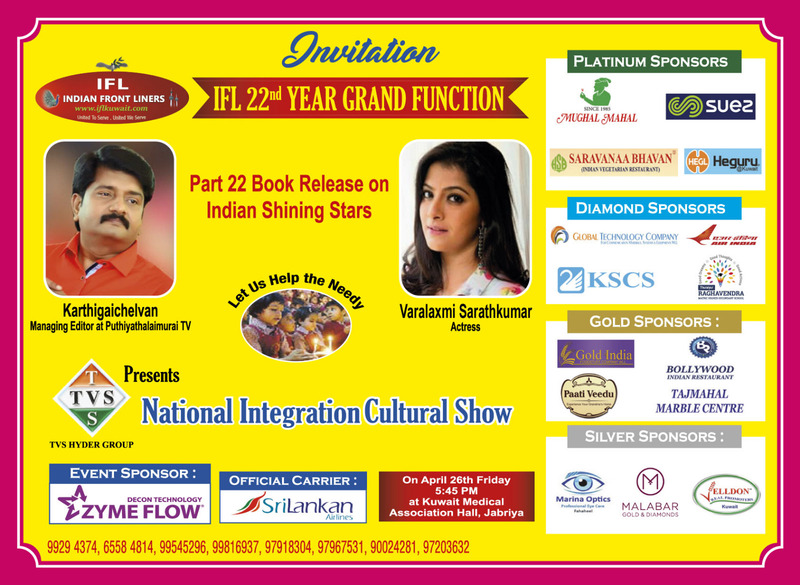 The Guests for the function are the famous Indian Personalities Mr. S. Karthigaichelvan, Managing Editor, Puthiyathalaimurai TV and Ms. Varalaxmi Sarathkumar, South Indian Actress & social activist. Karthigaichelvan is presently working as Managing Editor in Puthiya Thalaimurai, Tamil News Channel. Previously he worked for Times Of India as an Assistant Editor. He has anchored more than 1000 shows in Puthiayathalaimurai TV. He had appeared as an analyst in various news channels including Times Now, NDTV & Dhoordharshan. Karthigaichelvan's on field coverages during Chennai floods, Jallikattu protest, farmers death, Ochi & Gaja Cyclone are highly appreciated by the viewers. He had Closely worked with Former President Dr APJ Abdul Kalam for writing a book in Tamil. 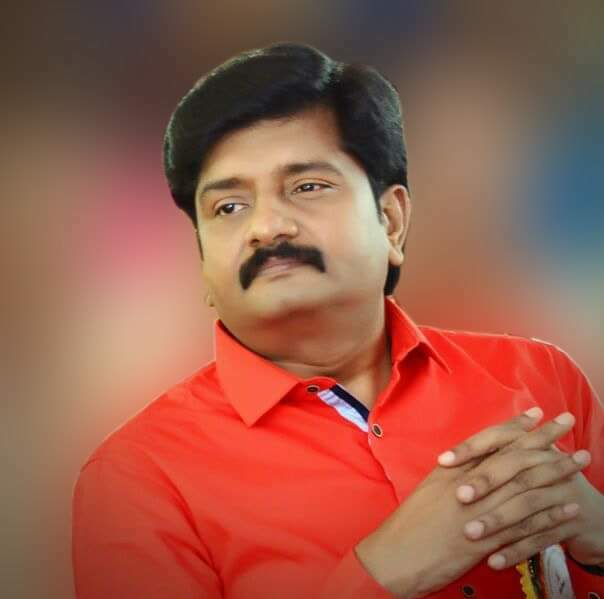 Karthigaichelvan is now anchoring a prime time show 'Nerpada Pesu' in Puthiya Thalaimurai TV besides anchoring Agni Paritchai. Varalaxmi Sarathkumar also known as Varu is a famous Indian movie actress who is predominantly acting in Tamil, Kannada, and Malayalam movies. After completing her training at the acting school, she made her movie debut in 2012 with Tamil movie and acted in various movies. She is also a trained Bharatanatyam, jazz, hip-hop, and ballet dancer, and was a part of dance group Hot Shoe Dance Company for eight years. In the year 2017, she has started a campaign ‘Save Sakthi’ to fight for Women Empowerment.